The computational magnetism group is part of the physics department theoretical condensed matter theory effort. We are interested in the development of atomistic spin models of magnetic materials. 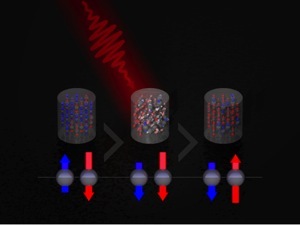 Until now, magnetic switching has relied on an applied field to reverse the direction of magnetisation. The speed of this process is fundamentally limited by the response of the material, and takes at least a nanosecond. Today our article on a novel magnetic switching process has been published in Nature Communications, entitled Ultrafast heating as a sufficient stimulus for magnetization reversal in a ferrimagnet, which demonstrates a completely new mechanism requiring no magnetic field at all. Our group used a sophisticated computer model to study magnetisation processes in Ferrimagnets at elevated temperatures and found the astonishing result that switching of the magnetisation direction occurred in the absence of a magnetic field. Visualisation of the ultrafast heat induced magnetic reversal process. Before the laser pulse, the two components of the ferrimagnetic material Fe (Blue) and Gd (Red) are aligned anti-parallel to each other. The 60 femtosecond duration laser pulse rapidly heats the material and the heating induces a transient ferromagnetic-like state, where the Fe and Gd sublattices are aligned in parallel. After the laser pulse the moments relax to their usual state completing a single switching event in less than 5 picoseconds. Experimental images showing the repeated deterministic switching of nano islands. 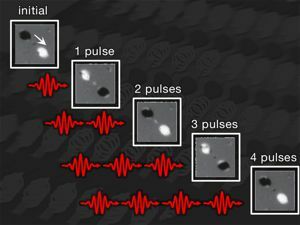 In order to test our theoretical predictions, colleagues at the Paul Scherrer Institut, Switzerland performed switching experiments on nanometre-sized magnetic dots. Here, the separation between the dots removes any stray field effect which might cause reversal.Switching was seen to occur in the experiments, in complete agreement with our model simulations. Initially the two nano-islands have different magnetic orientation (black and white respectively). After the application of a single pulse, the magnetic direction of both islands changes. Further pulses repeat the process, switching the magnetic state back and forth. 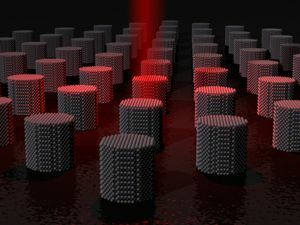 Heat-induced ultrafast reversal presents an exciting new possibility for future magnetic storage. The ultimate magnetic storage medium. Current magnetic storage in hard disk drives relies on an applied field to switch the magnetisation in the grains. However, ultrafast heat-induced switching removes a fundamental constraint in magnetic storage - the time required to switch the magnetisation. Imagine the ultimate magnetic recording medium consisting of many individual nanometre sized magnetic grains with a density of 10 petabytes/m2. Using the heat induced reversal process the data could be written to the device using an ultrafast heating process to drive the reversal at a data rate of 200Gb/s. Compared to today's hard drive technology this would allow 10 times the amount of storage capacity and 300 times the data rate. Of course many challenges to make such a vision a reality still exist, in particular requiring significant developments in the miniaturisation of ultrafast laser sources, magnetic media design, and a greater understanding of the physics behind the reversal process. Further details of the simulations and experiments are available in the published article here. In collaboration with Dr Irene D'Amico the group has been awarded a major EU grant to study ultrafast magnetisation processes. The project 'Multiscale Modelling of Femtosecond Spin Dynamics' (FEMTOSPIN) is funded to a total of € 4M and will be coordinated from York. Here the term 'spin' refers to the properties of the atomic magnetic moments of materials such as Iron, which behave dynamically in a way rather similar to that of a gyroscope. In the mid 1990s it was first demonstrated, using the heating effect of femtosecond pulsed lasers, that materials could be demagnetised on the sub-picosecond timescale. This extremely surprising result prompted some very exciting research at the frontiers of solid state physics. The aim of the FEMTOSPIN project is to bring to bear the power of electronic structure calculations, atomistic simulations and large-scale models on the problem. This 'multiscale' approach, having the aim of linking each formalism to provide an improved understanding of the underlying physics, is very challenging and within FEMTOSPIN we will be working with world-leading groups in Uppsala, Konstanz, Madrid and Budapest to develop new theoretical models of ultrafast processes. Very importantly, the project also involves state-of-the-art experiments by Groups in Nijmegen, Berlin and Oxford, which will provide a detailed and challenging test of the model predictions. The project also has technological relevance in that conventional magnetic recording is potentially limited by the (inductive) write technology used in current hard drives. FEMTOSPIN will provide a basic understanding of the physical processes underpinning the possible development of 'all-optical' recording technology which has the potential, not only for extremely high recording densities, but also data rates around 2 orders of magnitude faster than currently achievable. This aspect of FEMTOSPIN will be overseen by Seagate Technology; an industrial partner in the project. We are looking for 2 students funded by the FEMTOSPIN project. One studentship is to develop new approaches to the atomistic modelling of ultrafast processes by introducing more physical models of the energy transfer channels using ab-initio information. The second studentship is to investigate a new formalism based on the simulation of the conduction electron population by the laser pulse. Department of Physics, University of York, Heslington, York, YO10 5DD U.K.